A Betting Exchange training guide for arbitrage sports betting..
1. Betfair markets can often overreact at certain events and you can get yourself a risk free bet. Take a market where the English football team is playing another country. The nearer you get to the kick off the lower the odds become. English supporters want to show their patriotism by betting them to win. So back the team well before. When the odds have shortened near the kick off you will make a risk free profit. To find the best free Betfair tips look no further than TippingSports. Another example of overreaction. If a footballer gets sent off the stricken team's odds rise. Much more than the situation warrants. Get real time information on an event by using the Listen Now button. This is available on the markets page - radio produces the fastest information on a live event. Use the Search Markets option at the top left of the markets page. This will bring up a list of all the events for which the selection has entries. Say you want to know the races for which Kauto Star has entries. Enter the name and hey presto, up come all the races you can bet on. On the markets page use the More Options drop down list for Profit and loss display. The 'what if' figure shows what will happen to your Profit and Loss if unplaced bets match. Odds options including the ability to show fractional odds. You can bet on the outcome of Multiple Markets eg Football Leagues. 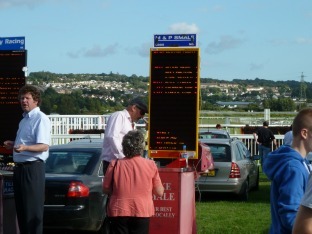 Betfair now produces its own Starting Prices which you can request before the start of an event. This ensures your bet will match at the Betfair Starting price. Use the Profit and Loss function to assess arbitrage sports betting opportunities. Watch for large amounts of unmatched money on one side of the market. So bet on the other side. When the market accommodates this money the odds will swing the other way. It may be possible to secure a risk free bet. Say you fancy Tiger Woods to win the British Open so you back him before the start at 5.0 for £100. As play continues Tiger is soon slaying the opposition and his odds drop to 2.0. You can now lay him to lose for £250 to realise a risk free bet. If Tiger goes on to win you stand to win £400 and lose the lay part £250 giving a profit of £150. If Tiger Loses you lose your £100 back stake but win the lay one of £250 giving a profit of £150. One word of warning when dealing in various arbitrage sports markets. Make sure you are aware of the rules governing a bet as not all markets and bookmakers will have the same rules. For example what places do they pay out in a horse race. Visit the Forum to get tips or the latest information from other punters on arbitrage sports. 3. Laying when you mean to back - make sure you don't click the back price when you mean to lay and vice versa. To help avoid this click More Options at the top left corner of any market. Under Odds Options you can change the colour of the lay column. This makes it distinguishable from the back side of the market. 4. Taking the available odds immediately in quiet markets. For example during a cricket match or football game. It is best to enter the odds you think are realistic and wait to see if they get matched. 10. Beware of typing errors - there are many daily instances of users confusing back and lay bets. Resulting in extreme movements in the odds available.